Starting from a waste/scraps (PET, PVC, HDPE. LDPE, PS, PA and ABS are the most commonly recycled plastics), through plastics recycling it is possible to obtain a new end-product with high technical features. A correct process design and extrusion technology are key factors to grant quality products and investment returns. 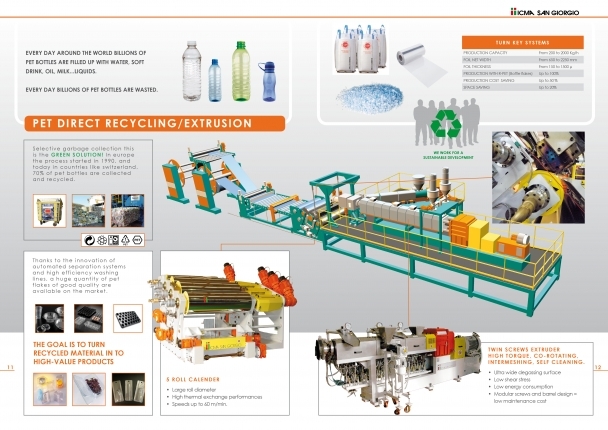 In the plastic recycling industry a innovation element is the use of co-rotating extruders that is becoming more and more a winning solution compared to traditional technologies (such as single-screw extruders) in facing most of the issues and challenges that plastic processors have to address today. 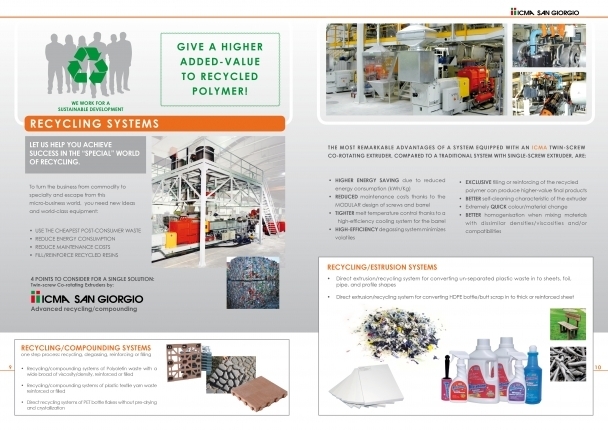 Icma San Giorgio has developed advanced recycling systems based on co-rotating extruders dedicated to the recovery of single polymers (HDPE, PA, PET etc. ), miscellaneous post-consumer materials (mixed plastics) highly contaminated plastic industrial waste general scraps (eg. tyre rubber). Taking most of their technical features from its MCM – “high torque” family, these specially designed extruders use a particular degassing and filtering systems able to treat demanding scrap materials so that current demand coming from many processors can be matched at the highest quality standard.